Sausages are one of the best innovations in the culinary world. It’s only in a piece of sausage where you will be able to find perfectly flavored meat in a neat edible package. What I like about sausage is that you can easily create them at home and make them taste unique every single time. All you really need to make sausages is a fine sausage stuffer. If you want to get the best sausage stuffer for your home, read on and start finding out how you can find one really quick! So, what’s the fuss about getting a sausage stuffer? Well for one, you won’t have to run down the butcher shop every now and then to get your sausages. This can help you save some time and money since you won’t have to get out of your house anymore. You can also be assured of the quality of meat you are using. Another great benefit of having a sausage stuffer is that you will be able to create completely personalized sausages right at your home. If you prefer lean meat, you have that option when you are making your own sausage at home. But the best advantage of having a sausage stuffer might be how it can help you create sausage without using any other tool in the kitchen. 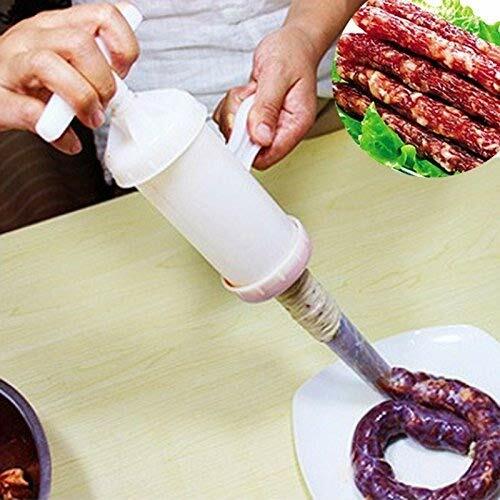 With a handy sausage stuffer, you wouldn’t have to mince the meat that you will stuff into the sausage. Sausage stuffers are also sanitary cooking tools that will allow you to reduce any instance of placing unwanted compounds in your sausage since all you really have to do is pack it with the meat and let the machine do most of the work. To figure out which kind of sausage stuffer is the best one for your home, you must first get familiar with the different kinds of sausage stuffers available in the market today. A horn stuffer is probably the cheapest kind of sausage stuffer in the market. It’s more like a tool than a machine. It’s basically a horn that comes with a pusher that you will need to push down so that the meat will come out of the other end of the stuffer and into the sausage skin. This is downright the simplest stuffer in the market. It is the best choice for beginners who are looking for something that isn’t overwhelming to use for the first time. It is direct to the point and very practical. 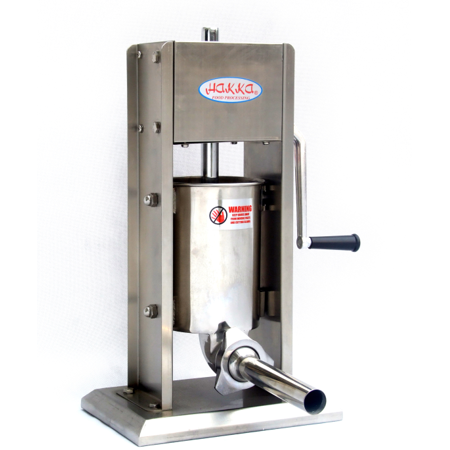 The vertical sausage stuffer is probably the most popular kind out of all the three. It is a great choice for both beginners and experts and it’s also available in both manual and electric models. Vertical stuffers can accommodate 5 up to 15 pounds of meat. It is a great choice for making large batches of sausages. 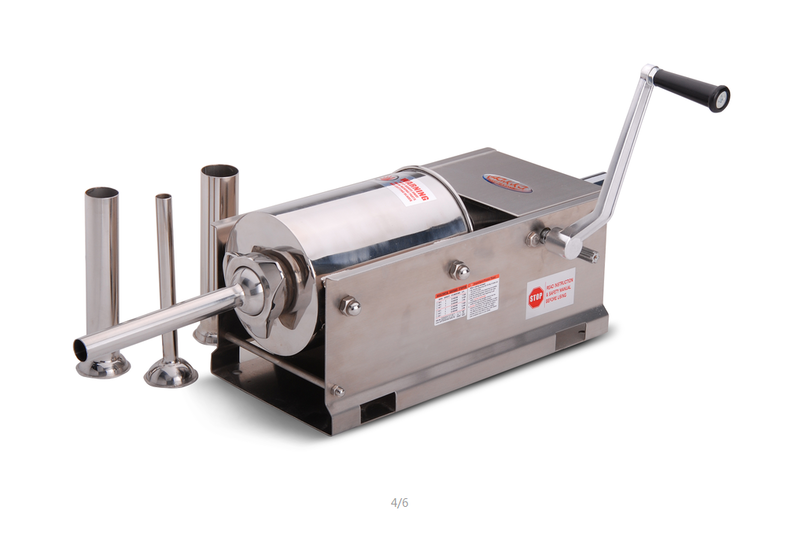 It comes with a mechanism similar to that of the horn stuffer, but instead of pressing down to squeeze out the meat, you will have to turn a handle or press a button to grind and stuff the meat into the sausage skin. A horizontal sausage stuffer works the same way as a vertical one, the main difference is that the meat chamber is placed horizontally rather than vertically. The horizontal stuffer can be a better choice than a vertical one if you lack the vertical space. 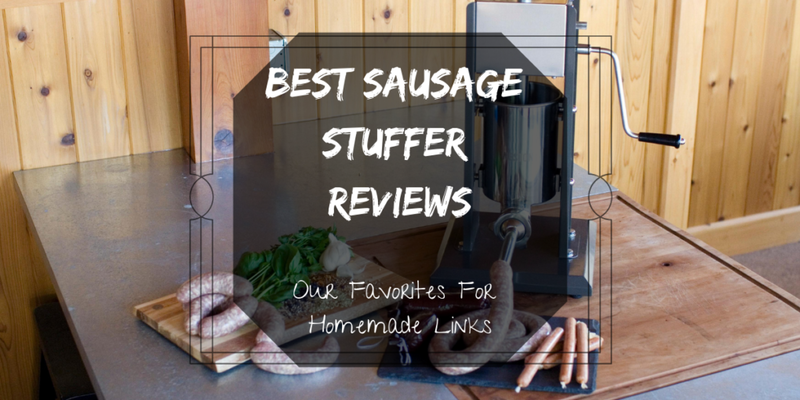 In this review, we will help you decide the right sausage stuffer for you. Let us now dive into the different factors you should be mindful of when it comes to choosing a sausage stuffer. As I have mentioned earlier, sausage stuffers can either come in a manual or electric model. Without a doubt, electric models are quicker and easier to use. However, do take note that electric models require more money. If you ask me, you won’t really need an electric model unless you are planning on using the sausage stuffer for commercial use. Sausage stuffers can accommodate 5 up to 20 pounds of meat. When it comes to choosing a sausage stuffer based on the capacity, just make sure that you are getting something that can fit your personal needs. Do take note that the larger the capacity, the heavier the machine will be and the harder it will be to clean and store away. Try to go with a sausage stuffer that you will enjoy using and try to avoid something that will just make your face cringe every time you use it. When it comes to the overall usability of a sausage stuffer, try to consider the available instructions, the design of the handles, and the simplicity of the controls. One thing that you should never forget is looking into how easy it is to maintain and use a product. When it comes to sausage stuffers, try to go with one that comes with easily detachable parts for seamless cleaning and maintenance. This sausage stuffer from Weston might be one of the most expensive machines in this list, but it sure is worth the bucks because it packs in a lot of interesting and useful features. Though it might be a little too much for entry level sausage stuffers, it sure is a great choice for experts. What I loved about this model is how it was so easy to assemble out of the box. Being so, it’s a machine that’s very easy to disassemble as well. This means that it’s very easy to clean and maintain. Since you can take this whole thing apart with ease, you also won’t have any problems with storage. Another great thing about this sausage stuffer is that it’s very safe to use. In fact, it comes with an air-cooled motor that reduces heat-ups and it comes with a circuit breaker for added control and safety. What’s more is that it operates quietly despite being an electric model. 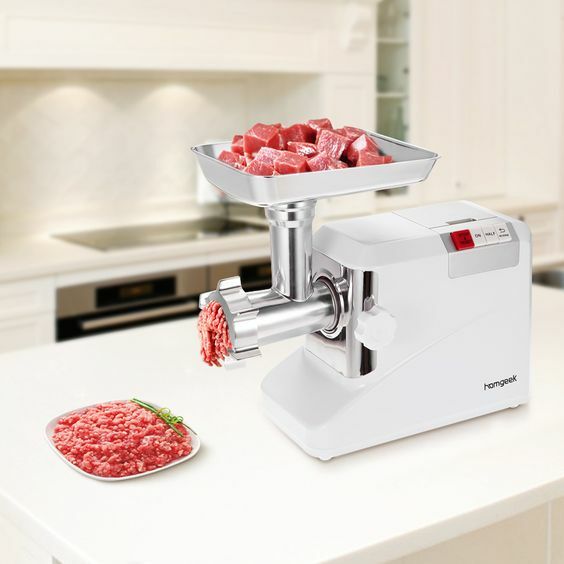 Lastly, this machine also offers extreme versatility because it doesn’t only act as a sausage stuffer, but as a meat grinder as well. It’s basically a 2-in-1 machine that can help you process meat and make sausages with ease. Another product that I would like to recommend is this 7 pound sausage stuffer from Hakka. 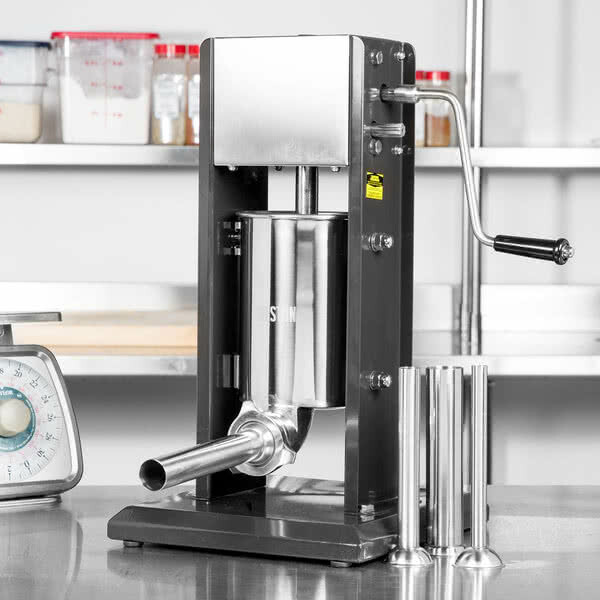 This sausage stuffer is a great choice for anyone who is looking to make large batches of sausage whether for personal or commercial use. What’s great about this machine is that its stainless steel components make it a very sanitary choice amongst others. Its stainless steel build allows for minimal bacteria build up and easy cleaning. What’s more is that it’s very easy to maintain since it is highly durable. Despite being a manual machine that requires a bit of labor, this machine is equipped with all-metal gears that will allow you to crank the handle with ease. Whether you are planning to stuff plenty of sausages or not, you won’t break a sweat with this machine at your disposal. Another great thing about this machine is that it comes with an adaptable base that will allow you to use it on different surfaces, therefore adding security and overall stability during stuffing. This VIVO sausage stuffer has got to be one of the most durable stuffers in this list. It is made with high-quality stainless steel that doesn’t only add to its overall durability, but to its ease of cleaning and maintenance as well. If you are looking for a sausage stuffer that will last for years of use, then this one might be the best choice for you. What I like about this machine is how it comes with a tilting body that ultimately makes filling simple and easy. Unlike other machines that would require you to fill from the top of the cylinder, this one allows for a more accessible angle. Another great thing about this machine is that it comes with a nice air release valve for seamless stuffing. It also comes with a piston that is made with aluminum, making for less clogging during stuffing. This machine is also very easy to clean. Because of its tilting design, you won’t have to bend over backwards to reach the end of the cylinder during cleaning. What’s more is that this machine comes with a very stable base that will allow you to secure it on your counter top during use. If you are looking for a sausage stuffer that is durable, yet comes at a lower price, this one might be the best choice for you. What makes it so is its combination of metal and plastic materials that make it an affordable choice. What I like about this sausage stuffer is its sleek and clean looking design. Despite being made with plastic parts, it’s still a highly presentable and attractive machine. Its cylinder is made with metal, while its handle and spout are made with hard plastic. What’s more is that it’s completely rust-proof, makes it quite easy to maintain over the years. Another great thing about this machine is how it comes with a stainless steel base that is very stable. Its stable base makes it stay in a great position regardless of its capacity. This machine also comes with a handy pressure relief valve that will allow you to create the perfect amount of pressure within the cylinder. Having this feature will allow for more seamless stuffing and added control over the machine. Lastly, this machine comes with a completely removable cylinder that will allow you to fill the whole thing with ease. It’s removable parts also adds to its overall ease of cleaning and maintenance. Another great sausage stuffer from Hakka is this 11 pound stainless steel stuffer. Whether you just like to make large batches of sausages or you plan to use it for commercial use, it’s a machine that will surely help you get the job done. What’s great about this machine is that it’s made with high-quality stainless steel that makes it a very durable stuffer that will be able to last you years. This machine is also quite versatile since it will allow you to create different-sized sausages because it comes with different stuffing tubes. Another great thing about this machine is that its handle is very easy to crank. It comes with metal gears and resin bevel gears that will allow for seamless turning. So, don’t be dismayed about its manual mechanism and don’t think this machine will make you break a sweat if you try to stuff sausages with a filled cylinder. Just like other Hakka sausage stuffers, this one also comes with a handy adaptable base that will allow you to place it over any counter. Its completely stable base will eliminate any worries of imbalance during stuffing. Needless to say, this 11-pound manual sausage stuffer is a great choice for both home use and commercial use. We recommend getting this vertical sausage stuffer that is built to last due to its heavy-duty construction. It can withstand a lot of abuse, ideal for people who do a lot of sausage making at home. Easily mounted on a countertop, it will stay in place while you work to fill up those casings with meat. The stainless-steel base has holes where you can attach it to any tabletop. This makes it easier to work with. No need to worry about air getting in your sausage as it has a piston that works with the air release valve. This feature keeps the air out while making your sausages. Included in this unit are 3 sizes of stuffing tubes. This makes a lot of sausage in one filling. The construction is heavy-duty and solid, so you can be assured that this will last you for a long time. Mounting it on a countertop is easy as well. The base is sturdy and doesn’t scratch easily. It comes with an air-release valve to allow air to easily escape. The kit comes with 3 stuffing tubes. It can be cleaned easily. You can easily remove the cylinder. A lot of people commented on how easy this is to use. Some said they have difficulties finding replacement parts. This manual sausage maker is for the cook who occasionally makes sausages for home consumption. All the materials used to make this meat stuffer has food grade properties and is completely free from BPA. The kit comes with two sizes of stuffing tubes – 3/8-inch and 6/8-inch. No fuss usage and convenient stuffing are some of the things this can offer you. Since there are no mechanical parts to deal with, you don’t have to worry that it is expensive to maintain. It is also easy to clean and maintain. This is a simple manual sausage stuffer that gets the job done with ease. All parts and materials are safe to use. It is easy to use. Even novice cooks can use this with ease. You can also let the children in on the fun. This is an affordable sausage stuffer to use. The kit comes with everything you need to get started. Everything is easy to clean. It is light in weight and easy to store. It doesn’t take up a lot of space in the kitchen. Some said even though this is a manual sausage stuffer, they are still able to finish their job fast. Some said if the meat is too dry, you will have a hard time stuffing. You can make different sizes of sausages with this sausage stuffer that comes with 4 different sizes of tubes. The manufacturer made assembly of this unit so easy. Usage is easy as well. Just clamp it on the tabletop and swing the handle and you are great to go. The 2.5 lbs capacity allows you to continuously make more sausages. And with the stainless-steel construction of the cylinder part, you can be assured that it will last for a long time. This is also resistant to common concerts such as corrosion and rust. This is a sturdy sausage stuffer. It is resistant to corrosion and doesn’t form rust as well. The unit comes with different sizes of sausage stuffer tubes. It has a large capacity for continuous stuffing. It boasts of easy assembly and disassembly. You can easily detach the parts for cleaning. This is an affordable sausage stuffer. It isn’t noisy to operate. The vertical design is a space-saver. It is even more compact than other vertical sausage stuffers out there. Some dealt with meat escaping out from the piston when they exert too much force. So, which of these products best fit your needs? 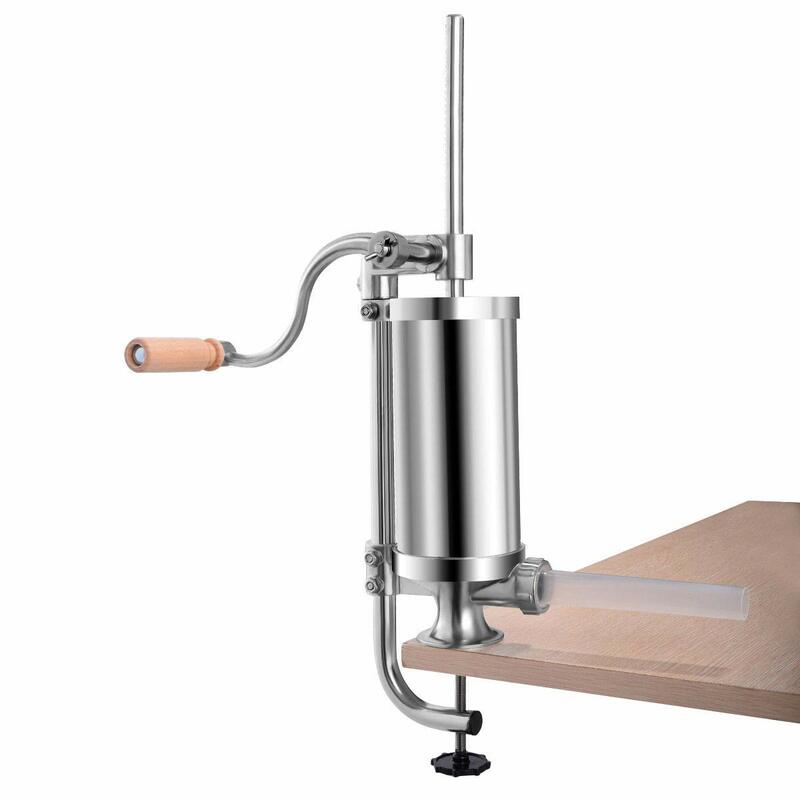 If you are serious about experimenting on making sausages, get the Weston Manual Vertical Sausage Stuffer. It has more professional features and qualities, making this better for advanced cooks. 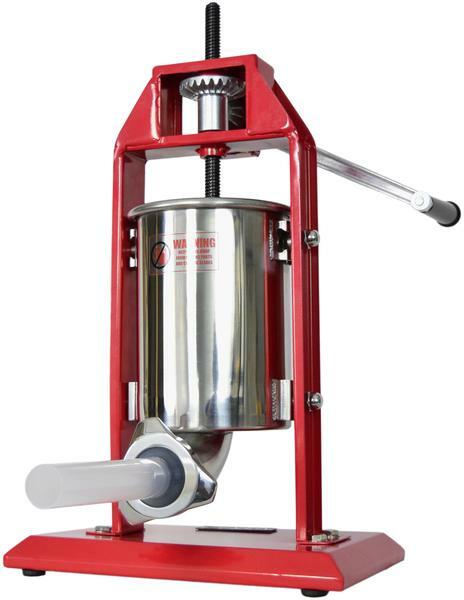 If you are looking for something with a bigger capacity to help you make more batches of sausages, the Hakka 7 lb/3L Sausage Stuffer is an ideal choice. Although Hakka 7 Lb/3 L Sausage Stuffer operates manually, it comes with every metal gear that makes cranking the handle comfortable and easy, making it the best sausage stuffer in our opinion. It requires manual operation but shouldn’t be too difficult to use even if you are using this for commercial purposes. Get the New VIVO Sausage Stuffer if you are looking for something that can produce sausages faster. This is different from others because of the tilting design so you can be assured that you can make more sausages without struggling to get your sausage stuffer to work. 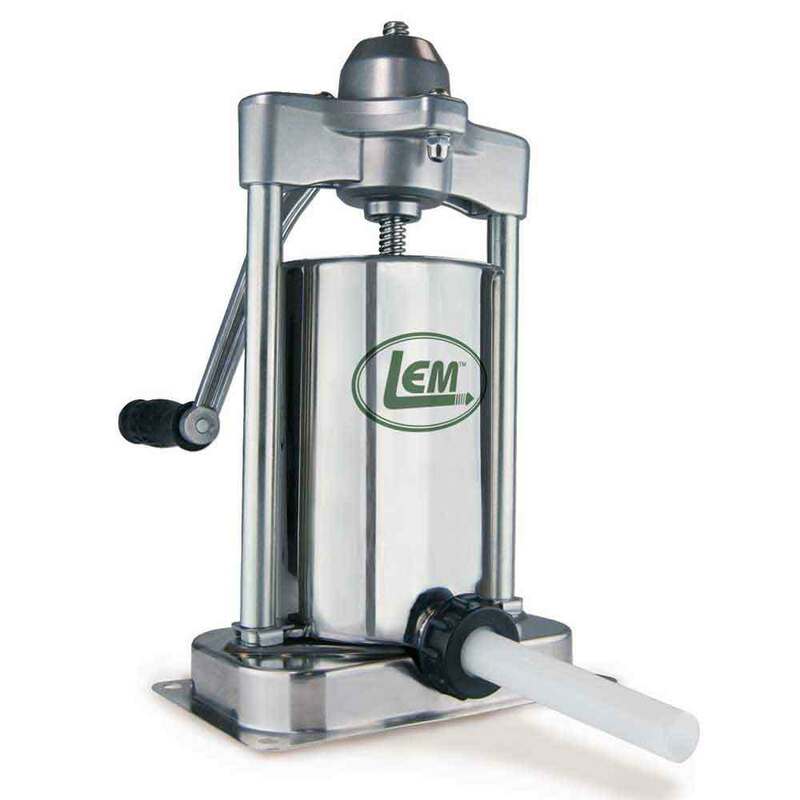 For casual cooks or hobbyists that don’t need a big stuffer, the LEM Products 5 Pound Stainless Steel Vertical Sausage Stuffer would be the best choice for you. It is smaller but still gets the job done well. The Hakka 11 Lbs Sausage Stuffer is ideal for people looking for one with adjustable speed settings. It is ideal for both newbies and professionals. 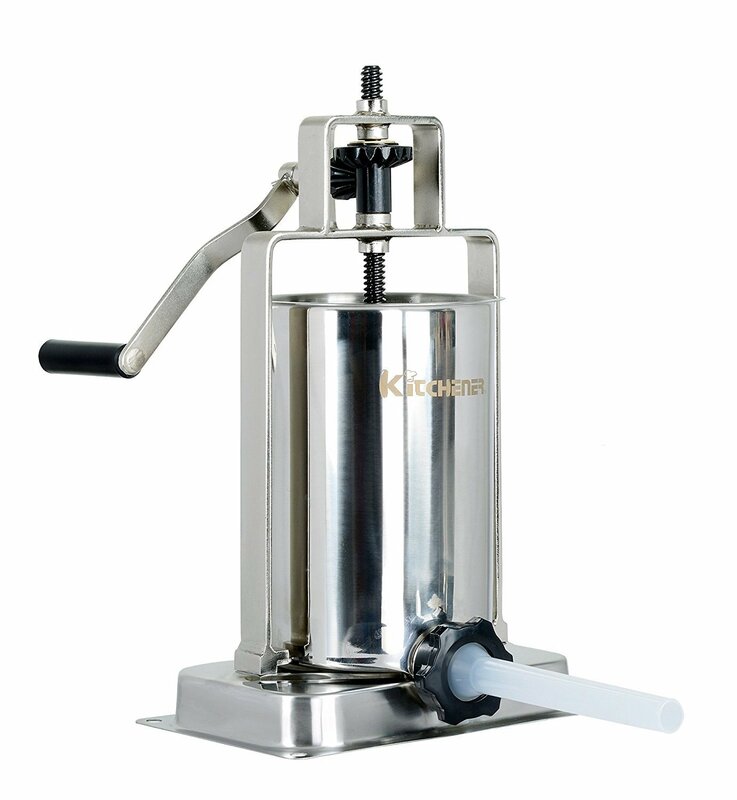 If you are looking for a heavy-duty sausage stuffer, get the Kitchener Stainless Steel Vertical Sausage Stuffer/Filler/Maker. This can hold up well against a lot of abuse and uses, so you can use it for a longer period of time. It also accommodates more meat, so you are able to stuff more sausages with ease. Looking for a more affordable sausage maker? Get the LiebHome Food Grade Sausage Maker Meat Stuffer. This might be a manual sausage stuffer, but it is so easy to use, you won’t even miss all the mechanical parts. Besides, since there are no mechanical parts to deal with, it is much easier to maintain and clean. The compact size of the Superbuy Goplus Stainless Steel Vertical Sausage Stuffer is what makes it an ideal choice for smaller kitchens. It still has a good capacity, so you can stuff more meat without stopping to replenish it. It is also easy to assemble, and clean-up shouldn’t be too much of a hassle. You might need to equip your kitchen with more tools. Check out our homepage for more product suggestions as well as reviews and recommendations.